This post contains an affiliate link. As always, all opinions are my own. Welcome to My Family Thyme! I am honored to be joining some very talented and creative ladies for May Flowers Home & Garden Tour. Memorial Day is such an important holiday to my family. It is a day for us to honor those who have lost their lives serving our country and celebrate our patriotism. 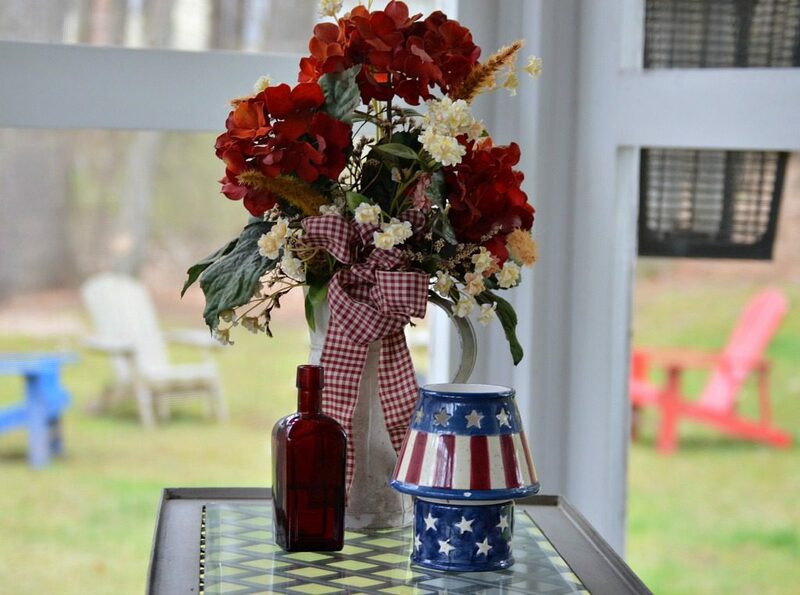 In anticipation, I have my porch all ready for our patriotic holiday and I would love to share it with you! This porch was one of the things that sold me on our house. It has really become another room for our family to use three seasons of the year and we feel very lucky to have this space to use, especially during porch weather! 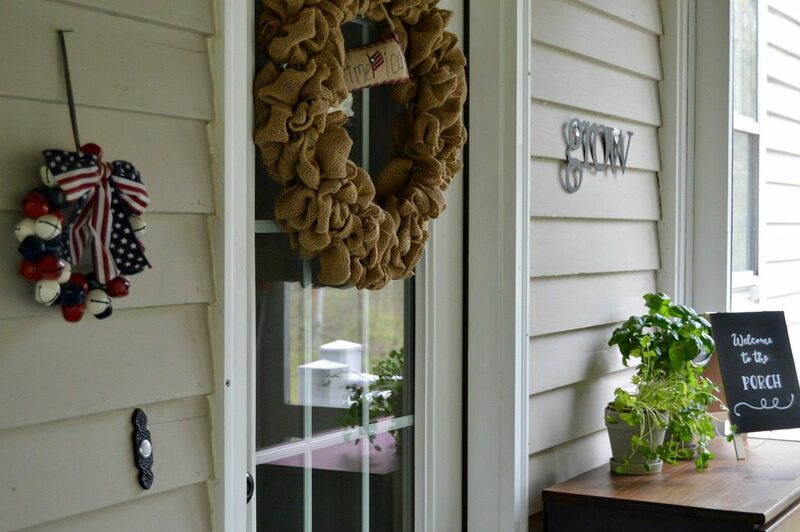 This burlap wreath hangs on the door that brings us onto our porch. 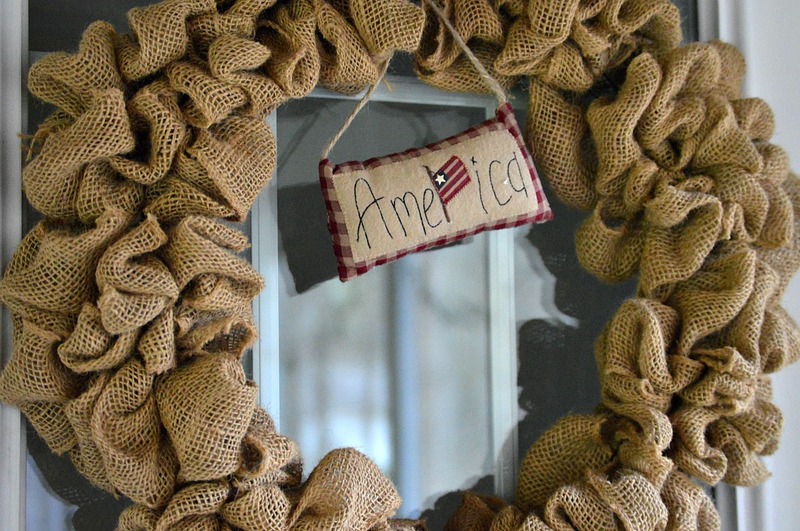 I made this easy burlap wreath using a wonderful tutorial from Laura at Duke Manor Farm. I love to keep this wreath plain and then add little seasonal touches throughout the year. In this little area of our porch, I have a dresser that belonged to my son when he was a baby. I have since refinished it and now use it for storage out on the porch. Just a coat of paint along with a couple of applications of sealant and it can stay out here all year long. I love Target…especially its Dollar Spot. Last year, I picked up this little chalkboard easel and I recently picked up this metal GROW sign there. To decorate the chalkboard easel, I used a printable I made using fonts from Angie Makes and used the same process I did in Back to School Chalkboard Art. 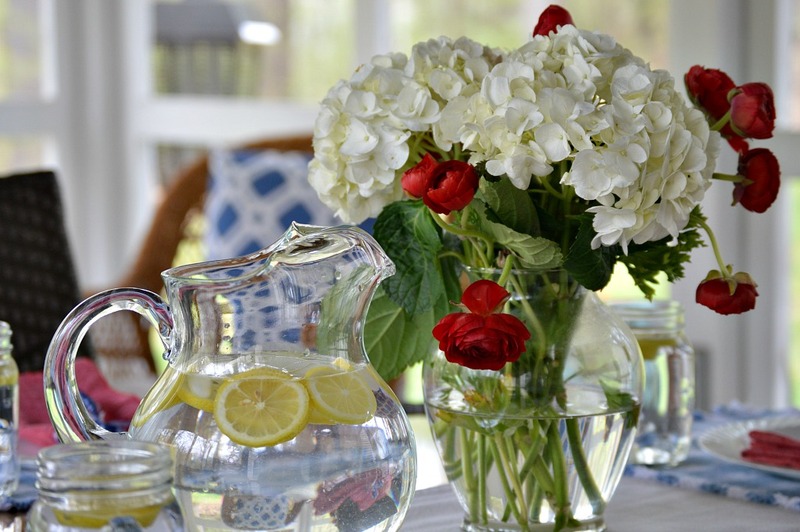 Printables are a wonderful way to add little decorative touches for very little money. 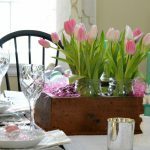 I’m happy to share my library of printables with my subscribers and I would love to connect with you. Please consider subscribing to my newsletter at the end of this post. As soon as the weather starts to warm up, my family and I eat out here as often as possible. This is where you’ll find us for dinner…grilling and enjoying our favorite Mediterranean Couscous Salad. If you haven’t given this salad a try, you definitely should! 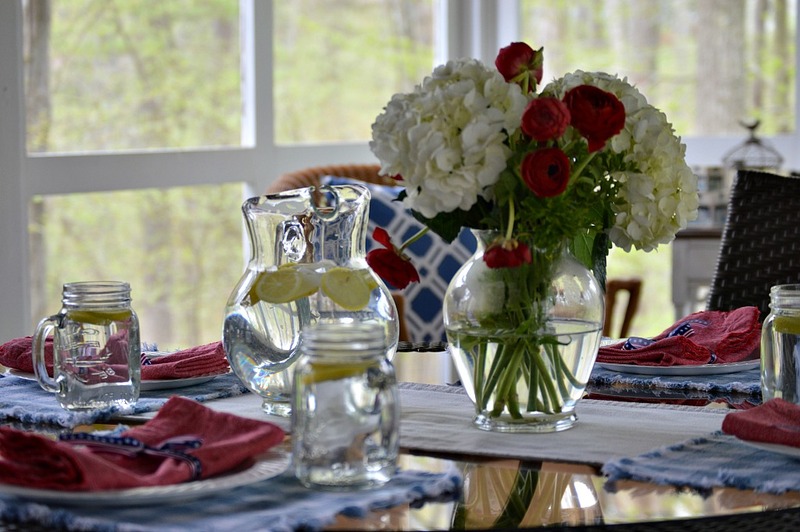 Fresh flowers are one of my favorite decorating elements. The colors and textures are just amazing. I recently picked up these beauties at Trader Joe’s. Here in Connecticut, the trees are just budding and everything gets blanketed with that lovely yellow pollen…yuck! We’ve been sneezing here for the past week, but once that pollen is done, this is where you’ll find us. You might find me here reading, correcting papers, or even writing this blog. 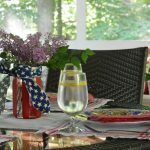 It’s the perfect place for the kids to host their friends and for us adults to entertain. In just two short months, we will be hosting a graduation party here for my son, Christopher. So much to look forward to! 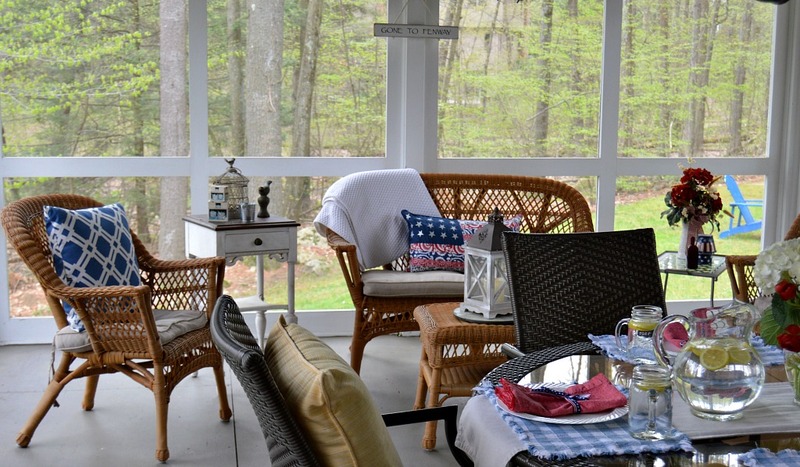 The furnishings and accessories on our porch are an eclectic mix. They’ve been collected through the years from many different places. 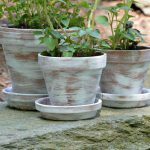 I love to refinish items and given them a new life. This side table was a $10 garage sale find. I gave it a coat of Old White Annie Sloan Chalk Paint two years ago, along with some clear wax. It has held up exceptionally well. 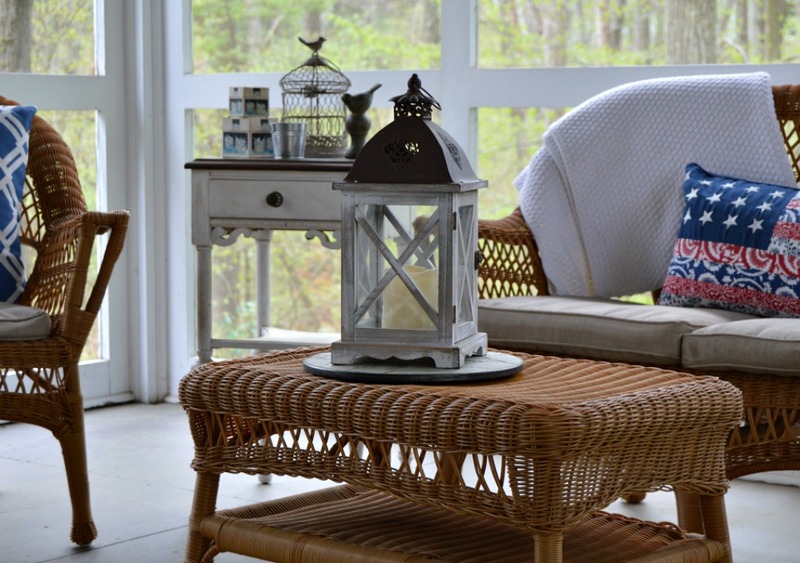 For some great furniture refinishing ideas, consider this resource book from Annie Sloan. Home is a place of comfort, and nothing says comfort quite like an inviting knitted blanket. Instead of keeping those blankets hidden away in closets, I like to bring them out and drape them to add texture and create an inviting space. Then add a few pops of color with some fun pillows from Home Goods! Would you believe that this table is another tag sale find?! I used to be a girl that liked everything to match. Now that I am getting older, I tend to purchase things that I like and not worry that everything matches perfectly. It’s comfortable and perfectly imperfect. I’m so glad you stopped by for some porch time and I hope you visit again! 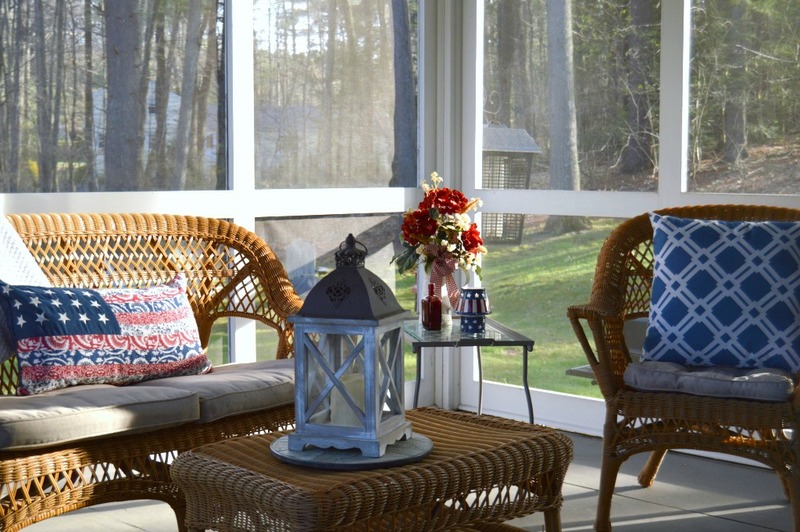 Do you have an outdoor space that you enjoy decorating? What is on your spring to-do list? 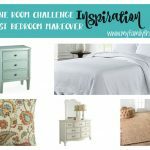 Please visit these talented and creative bloggers! 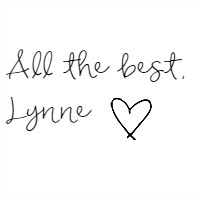 Hi Lynne: Everything about your tour is comfortable and welcoming. That sunroom/porch is a show stopper for sure. I love the inside of your home but the outside setting with all the gorgeous trees and wide open spaces is so serene looking. It all goes together to really create a lovely mood. Thanks for opening your door, I enjoyed touring around. Your porch is beautiful!! I love all the handmade touches. Doesn’t Trader Joe’s have the best flowers? I live in CT too! What a lovely spot! I also love Target’s dollar spot though it isn’t all a dollar. I have been buying a lot of office decor there that I hope to share in an upcoming post. I can just picture you all living on the porch (I think I have a pinterest board called that…I need to pin this there!) What a tranquil setting nestled in the woods and I see a peek of lawn out beyond it. Truly a special private family paradise. Your table setting is so inviting and I love your wreath. What a beautiful welcoming porch you have! I bet many wonderful memories are created right here! 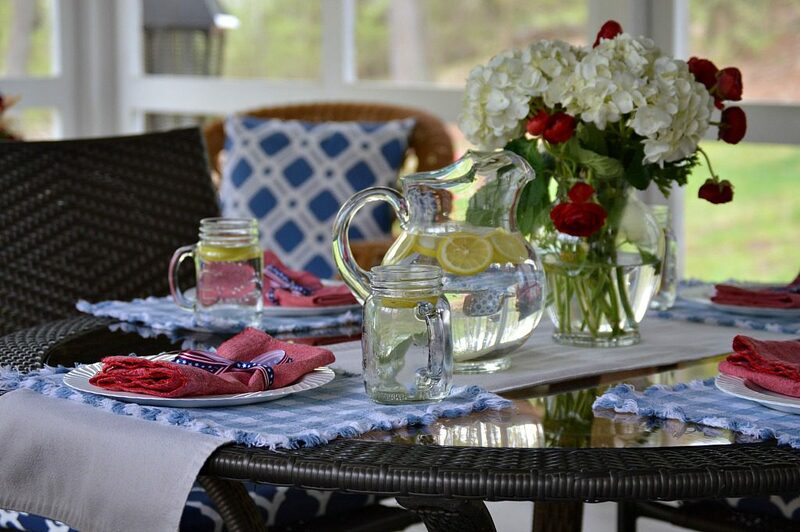 I hope that the pollen goes away real soon so you can enjoy your beautiful space and those amazing flowers on your table! Just stunning!! Lynne, I love your wreathe, but oh my word, I am all about the porch! It is so beautiful ! I would live out there. I’m from New England too, NH actually, and there have only been a couple porch days so far! Your pics are so clear and crisp!! Great job! Your porch looks so incredible! Wish I’m as creative as you. Thanks for sharing! Thank you for your kind words! Best wishes for a wonderful weekend ahead! Very nice post. I just stumbled upon your weblog and wanted to say that I have truly loved surfing around your blog posts. After all I will be subscribing to your feed and I’m hoping you write again soon! Thank you for your kind comment! Best wishes on your community project! Your porch is so welcoming! What a wonderful spot for family dinners and hanging out 🙂 Thank you for sharing with us! Lynne – This post looks like a magazine photo shoot! Your photos are excellent! 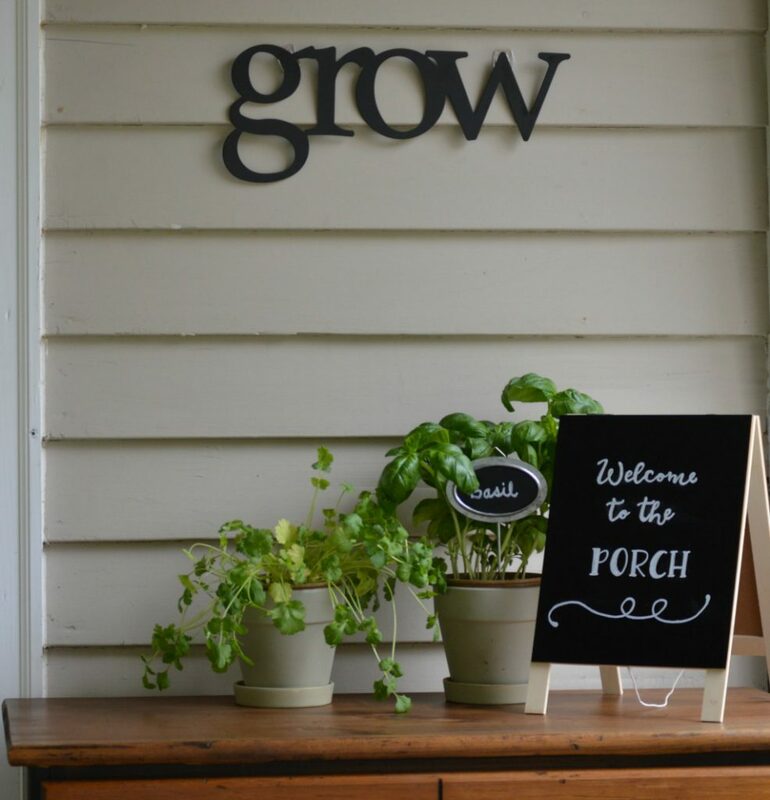 Your porch is so inviting and cheery! What I so appreciate about your style is everything genuine and well-loved. Nothing is showy or pretentious – just warm and welcoming. Thank you for sharing! !